For those applications where being seen is of the utmost importance, MCR Safety's Luminator™ Series offers you a variety of high visibility garments made in different colors and different options of reflective material. The 518C is a fluorescent lime 49 inch coat that features dual silver reflective stripes around the torso and stripes over each shoulder. 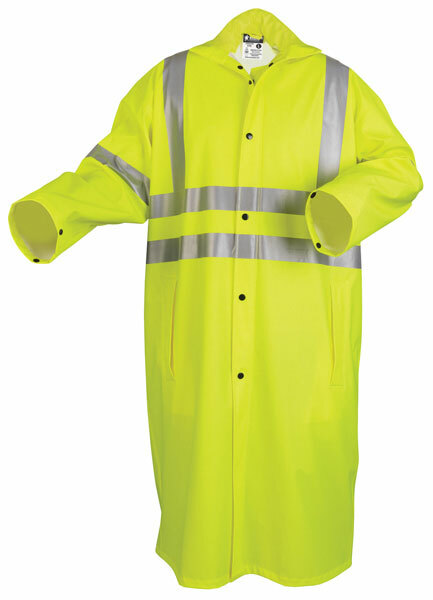 It also features a hide away hood, meets or exceeds ANSI/ISEA Class 3 high visibility standards, and has a snap front with storm fly. This garment is treated to be limited flammability. This garment is not flame resistant as defined by ANSI/ISEA 107-2015 Section 10.5. For more information on Limited Flammability, Click Here.